I have been looking for the Caronia Sweet Bliss Collection here in Cebu for some time now, but I just couldn't get my hands on any. So, I got tired of waiting and found these beautiful nail polishes from Klik instead. I'm just glad to have found them, they're only Php 14.50 each at Metro Ayala Center Cebu. These nail polishes are very sheer and I had to apply three coats for the colors to really show. But it's pretty much what I expected from a cheap nail polish, so I can't complain. The last one on the right "Glow" is retailed at Php 19.50 it's the only one with a different price because it actually a "Glow in the Dark" nail polish! How cool is that! The Glow in the dark polish is on my thumb, I tried turning off the lights in my room to test if my thumb would really glow, and guess what, it did! I just don't know how to take a photo of it. LOL! @Aya, oo nga so cool talaga, promise I'll take a photo. 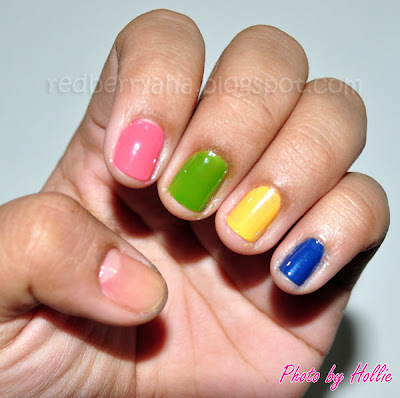 @Hazel, yeps saw her posts about this klik polishes too. will really try to take a photo of glow in the dark. I'm still thinking how i'm going to that. @Ar-Ar, I think this is only available at Metro Department stores, I'm not entirely sure though. @Tiffiefum, thanks sis! I appreciate it! kakatuwa naman yang glow in the dark na yan... sana meorn sa hortaleza. Where did you buy this?